For those of us in the digital signage industry, we’re in the midst of our busiest time of the year. At this point we’re well-traveled – having hopped from ISE in Amsterdam to DSE in Las Vegas and now we find ourselves at InfoComm in Orlando. These events afford us the opportunity to speak extensively with customers, partners and fellow vendors, and from those discussions we’re gleaning some great insight about the months ahead. In general, there is a great deal of optimism and excitement about where our industry is headed. Even though the year isn’t yet half over, we’re seeing some interesting trends emerge – trends that will be responsible for much of the growth we’ll see in the remainder of 2013 and beyond. To start with, we believe that the demand for rich content and interactivity will drive explosive growth the second half of this year. We’re seeing a proliferation of rich, compelling content developed in HTML5 and delivered in HD. 4K HD is on the horizon as well – this new, ultra high-res video format has twice the horizontal and vertical resolution of 1080p, with four times as many pixels overall. It can be delivered using a new codec called H.265 that provides a 50% bit rate reduction so file size remains manageable. The crux of all this, however, is that rich media like this requires powerful devices capable of hosting, managing and serving it up, and software capable of supporting the latest development tools. Additionally, the ubiquity of touchscreens is driving big growth in interactivity. This shift is a direct result of the proliferation of smartphones and tablets. 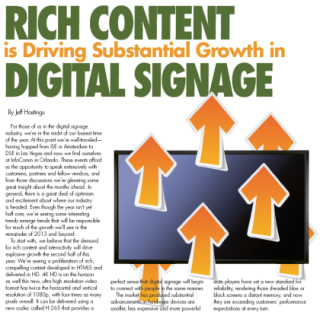 People are comfortable with touch/swipe as a method of interaction with their devices, so it makes perfect sense that digital signage will begin to connect with people in the same manner. The market has produced substantial advancements in hardware – devices are smaller, less expensive and more powerful than ever before. Our new XD players are a great example of hardware that's more than capable of handling today’s rich media, with the ability to scale as content continues to develop in the months and years ahead. And we’re reaching an inflection point where the richness of content is matched by the impressive capabilities of today’s hardware. While the shift to solid-state technology is becoming commonplace, installers and end-users must remember to choose carefully and be sure they are investing in the very best equipment. Solid-state players have set a new standard for reliability, rendering those dreaded blue or black screens a distant memory, and now they are exceeding customers’ performance expectations at every turn. The common thread in all these trends is the co-dependence of hardware and software – and this rings true now more than ever. We stand at the confluence of rich content and robust hardware, and what results is digital signage that’s nothing short of breathtaking.